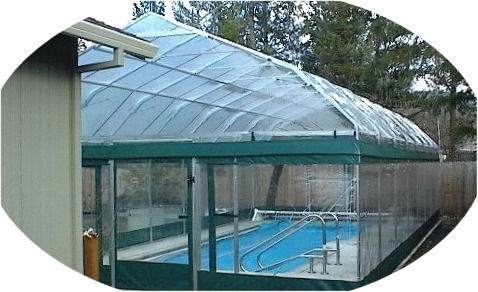 Over the years, we have received many requests for an economical screen or vinyl enclosure for pools. After surveying the market to see what the offerings really were, we decided to develop and manufacture our own modular screen system. We call this unit the "Aluma-Room". The "Aluma-Room" systems project began in the summer of 1999. We began by examining the various screen fabric and solid vinyl fabrics available for such a product. Aluminum Tubing and Fittings for the framework needed to be selected and tested. Shipping such a product had its own considerations. Fabrication of the various frame fittings, wall & roof systems, and entry options needed to be addressed. During the development process of our new swimming pool enclosure, a primary goal was to keep the design simple enough to allow the installation to be completed as a "do it your self" Project. In addition, our team decided early on that the unit should not only be able to be used as a screen room, but that it could also be fitted with clear vinyl or solid color vinyl walls and tops if desired. After much effort and investment, we are now producing the "Aluma-Room" pool enclosure, which is Attractive, Economical, Strong, Provides Additional Pool Safety and it's Easy to Assemble! Can be used All year in many areas. for the winter and a Screen cover for the warmer months! All Framework is Extra Heavy Duty Aluminum. Designed and Manufactured to be a "Do it Yourself" Project. If you're searching for discount sale prices on Ameri-Brand Archives and want the best online bargain pricing use the green "Get Prices" link on the upper right hand corner of this page. We invite you to compare the quality, value, and warranty of our merchandise. We offer coupon-less sales that help you shop and get what you need at a low cost. We're proud to be a favorite stop for Do it yourself DIY enthusiasts and professional dealers alike. Looking for Ameri-Brand Archive replacement parts, accessories, or instructions and guides on how to repair or fix a used or older item, or on how to make a brand new item, our web pages can provide the latest top quality information and relevant product education. Try our free online care and maintenance guide pages to learn about cleaning, storing, and other related procedures to get the most from your purchase. Need an installation manual on one of our products? Our online pages provide step by step details that can help you install them. Many of them include pictures, images, and diagrams showing how to get the optimum service from the products and kits you buy from us. If you desire more information on Ameri-Brand Archives, please call the toll-free number above. Ameri-Brand Products Inc, providing Ameri-Brand Archives for the areas & communities of New York, Los Angeles, Chicago, Houston, Philadelphia, Phoenix, San Diego, San Antonio, Dallas, San Jose, Detroit, Indianapolis, Jacksonville, San Francisco, Columbus, Austin, Memphis, Baltimore, Fort Worth, Charlotte, El Paso, Milwaukee, Seattle, Boston, Denver, Louisville, Washington DC, Nashville, Las Vegas, Portland, Oklahoma City, Tucson, Albuquerque, Long Beach, New Orleans, Cleveland, Fresno, Sacramento, Kansas City, Virginia Beach, Mesa, Atlanta, Omaha, Oakland, Tulsa, Miami, Honolulu, Minneapolis, Colorado Springs and Arlington with quality Ameri-Brand Archives.